From left to right: Mark Meding, On the Road marketing principal; Philip Cajka, Audio-Technica president and CEO; Tim Chamberlain, On the Road Marketing senior account manager, Upstate New York; and Andrew Pernetti, Audio-Technica territory manager, professional markets. Photo by Corey Walthall, Clyne Media. Audio-Technica has recognized Riverdale, NJ-based On the Road Marketing with its Samurai Award for the 2015/2016 fiscal year, for its Upstate New York territory. The award was presented to Mark Meding, On the Road Marketing principal, and Tim Chamberlain, On the Road Marketing senior account manager, Upstate New York, by Philip Cajka, Audio-Technica president and CEO, and Andrew Pernetti, Audio-Technica territory manager, professional markets. On the Road was recognized for exceptional representation of Audio-Technica’s complete line of professional audio products in Upstate New York (the territory personally represented by Tim Chamberlain). Audio-Technica held the awards ceremony to honor its dedicated force of manufacturer’s representatives during InfoComm 2016 on June 7 in Las Vegas. 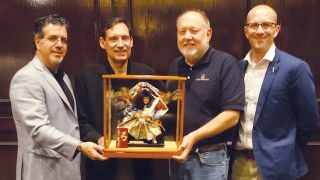 The A-T Samurai Award recipient was congratulated for outstanding sales performance and bestowed with Audio-Technica’s beloved Samurai doll. On the Road Marketing was acknowledged for its consistent success in the areas of sales, marketing, and customer service.